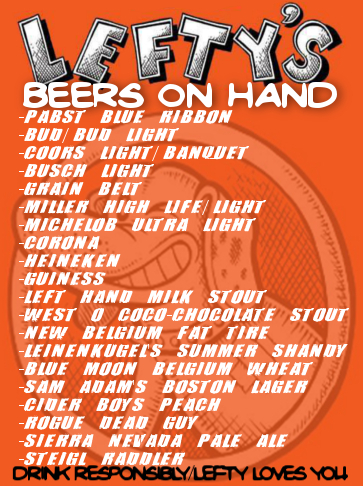 Lefty’s Live Music is a 350 capacity concert hall and full service bar in Des Moines Iowa. Our business model is focused on quality entertainment, quality sound and quality atmosphere where all genres are welcome. A space that can accommodate everything from large touring bands to garage bands, Lefty’s was born from the old adage “if you want something done right, do it yourself.” Des Moines is home to a diverse and talented music culture and a sound centric venue is necessary for its continued growth. Recently added: Soundcheck IPA (PeaceTree Brewery), and South Citra (Confluence). Sign up for our newsletter and receive Lefty's updates, show alerts and more! We promise not to spam the crap out of you.